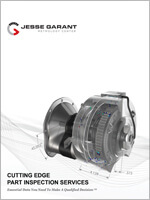 Jesse Garant Metrology Center is the specialized nondestructive testing lab manufacturers trust for rapid validation of machined parts, ensuring quality standards are met every time. We continue to invest in current technology to keep up with the latest demands for NDT and metrology of machined parts. Our lab has conducted inspections for a wide range of machined parts for numerous applications in performance racing, engineered products, space, defense, and aerospace. Our NDT systems inspect complex parts and assemblies of a range of sizes, shapes, and materials like stainless, carbon, and tool steels, aluminum, brass, and plastic. We’ve inspected a variety of machined parts, including: brackets, gears, gaskets, pulleys, heat transfer boxes, housings, enclosures, and consumer parts. Nondestructive testing during pre-production plays an integral role in ensuring parts are machined to original specifications. Our industrial CT services identify defects and validate fit and function of first run parts without destructive testing, resulting in faster time to production. We also obtain highly precise dimensional data for satisfying First Article Inspection requirements for out of tolerance features, walls, or drilled holes. Nondestructive testing with CT can be done at specified intervals or for 100% validation of internal part dimensions. Our NDT services ensure machined parts for critical applications meet quality standards before reaching their final destination. Industrial CT generates useful feedback for monitoring machining processes, including techniques like CNC, EDM, laser cutting, and electro-chemical erosion. We take the guesswork out of quarantined, warranty, or recalled machined parts using industrial x-ray testing. Our inspection process is traceable, repeatable, and customized to meet client needs, providing definitive data to isolate suspect parts form an otherwise good lot. Industrial CT is also available for lower volume part sorting to identify out of tolerance machined features. 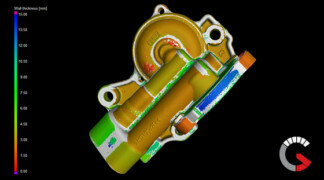 For conducting detailed failure analysis of machined parts, industrial computed tomography is the ideal tool. CT preserves original failure conditions with only minimal fixturing, identifying and modelling virtually all types of defects, including: porosity, voids, and cracks, inconsistent wall thicknesses, assembly misalignment’s, and tolerance deviations from CAD.